Choice is natural. Choice ensures competition. Choice is good. But sometimes there's too much choice, and we need a helping hand through the forest of indecision. Take the act of choosing a Linux distribution, for example: of the hundreds that are out there, all with their slightly different goals and values, how do you know which one is going to be right for you? You could try every single one of the top 50 ranked Linux flavours on Distrowatch, or you could let us do it for you – brilliant! 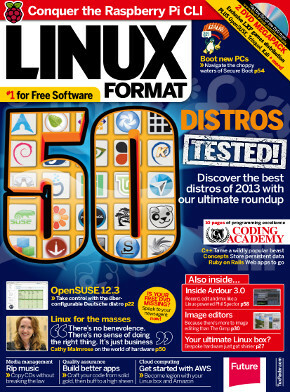 Also in the mag we've more on the UEFI debacle, a roundup of image editors, an inside look at audio editing with Ardour, Hotpicks and a gaggle/pride/murder of brain-expanding tutorials. Have fun! On the disc: This month it’s a super-special double disc issue. We’ve built our very own gaming distro that allows you to play some of the best open source games without installing them. On the second disc we’ve got OpenSUSE, Kali and Trisquel. Enjoy!